Amid a crowd of angry neighbors holding bright signs with slogans such as, “No To Tiny Homes,” and “Not In My Backyard,” Santosha Village Founder Haiyan Khan sits in a fold-out chair with a look equal parts stunned and exhausted. Khan’s Q&A session for the neighbors to voice concerns to both him and their council members has turned into a protest, and this realization strikes Khan as he sits on the vacant lot in New Orleans East, which his village will now be unable to inhabit. “The neighborhood has been mistreated for so long,” says Santosha Board Member Kalpana Saxena, “they don’t have a lot of trust for anyone coming into their community making promises to them.” The residents of New Orleans East certainly have a reason for their fears. Since Hurricane Katrina, the New Orleans suburb has typically served as the area in which low-income residents have been pushed, and the area now faces a heavy amount of crime. 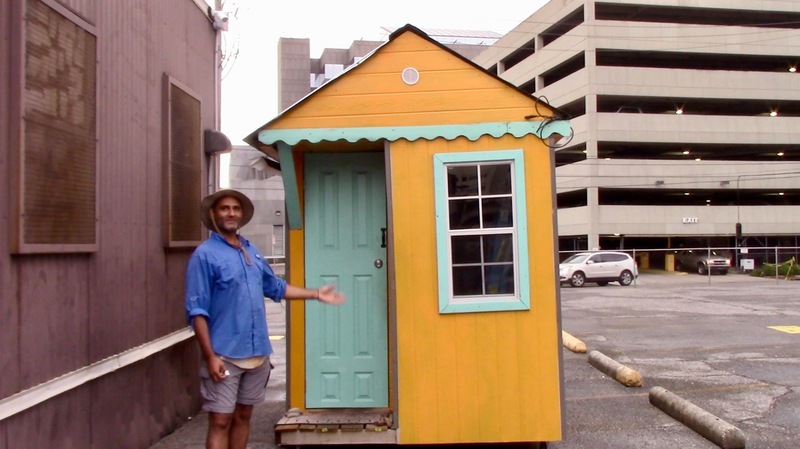 Santosha Village is a proposed community of tiny homes that would be occupied by formerly homeless individuals, who would pay a small amount of rent in order have access to shared amenities such as showers, kitchen, and a garden, as well as their own tiny home–where they could sleep and store their personal items. Originally planning to occupy an overgrown lot off of Chef Highway, Santosha Board Members have needed to find another location for the project in response to the outcry from members of the community. As a result of the history of sticking New Orleans East with “undesirable projects,” the residents were anxious to make sure that their interests were being represented. “New Orleans East has become a… depository for social experiments,” says resident Jim Ewers to WDSU, “and we cannot become a social experiment.” Other neighbors also pointed out concerns that the Santosha helpers were not from New Orleans East, and so did not need to deal with any negative consequences from the location of the village. Among other things, Gahr pointed out one piece of footage which was used in three different video reports from the local news. Among many different perspectives of neighbors voicing their concerns about Santosha Village, the only clip of Haiyan Khan is tacked on at the end of the video. In it, Khan asks the viewer to consider the people who Santosha proposes to help, saying that someone needs to assist them. However, with the format of the video player, which automatically queues up another video, this “due diligence” quote is cut off midway through, rendering it incoherent unless the viewer elects to pause, rewind, and watch the clip again without the automatic queue. With Santosha Village moving ahead with secondary locations and planning, and the neighborhood settling back into its routine, the overgrown lot on Warwick Place remains empty, with only a wooden sign advertising Santosha Village, flanked on both sides by bright plastic ones reading FOR SALE, left behind on yet another undeveloped property in New Orleans East.